Consistently in the top 10 things to do in most Hong Kong travel guides, this is truly a memorable experience. However unlike the main attractions this is far less busy. Maybe due to its location or maybe because some walking is involved, I’m really not sure. But I can assure you the trip here is worth it. 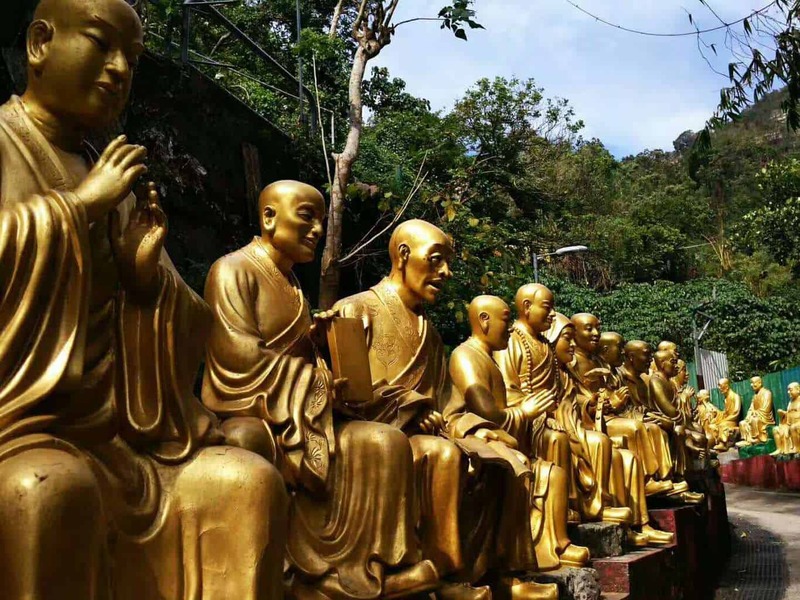 The Ten Thousand Buddhas Monastery is a wonderful addition to your Hong Kong itinerary . It was founded in the 1950’s and is not only just one monastery, but consists of 5 temples, 4 pavilions and 1 pagoda. The name is actually deceiving as there are over 14.000 buddhas here. Tucked away, this is not the easiest place to find, but when you do you be instantly blown away by the sight. Lifelike golden Buddha’s, glittering in the sun, stretching as far as the eye can see. As you ascend the 430 steps you will be gazed upon by these looming figures. Quite a surreal experience. And a great selfie opportunity. Check out each Buddha, each one has a unique and different expression. Some jovial and some menacing. Choose your favourite! The statues become grander and more ornate as you climb and at the top is a wonderful temple where you can pay your respects. A magnificent view of downtown Hong Kong is provided too. A Perfect gift after a long climb. This is a very peaceful spot, and you can just while away some time here, wouldn’t even believe you are in a mega city like Hong Kong. At the top there are several temples you can look at, and a nice water feature that apparently brings good luck. Many female buddhas are also here in all their splendour. The main hall has more than 12,000 small golden buddha statues alone! A giant towering pagoda also greets you at the top. All one can do is just gawk at it in awe. This pagoda is actually featured on the HKD 100.00 banknote and is an iconic landmark of this city! You can have the chance to climb the 9 floors and see the vista below you. You can sit and rest for a while, or snap some pictures. You can go down again, but this time using a different path. Fewer Buddha’s on this route but watch out for the monkeys. They will appear and try to steal your belongings so be careful! Or possibly just sit and watch you as you go by, who knows! Going down you will wind through a local community, with houses and daily life, a nice end to day. Walk forward past the bus station and keep on the left hand side, heading towards the mall. Turn left at the mall and walk towards a giant cemetery (do not go in here) just to the right of that is a tiny little path. Enter here and you’ll see some gold statues, you know you’re in the right area then. Next Next post: Merchiston International School (MIS): The Future of International Education in Shenzhen?